"In response to the new Facebook guidelines I hereby declare that my copyright is attached to all of my personal details, illustrations, comics, paintings, professional photos and videos, etc. (as a result of the Berner Convention). them under protection of copyright lawsBy the present communiqué, I notify Facebook that it is strictly forbidden to disclose, copy, distribute, disseminate, or take any other action against me on the basis of this profile and/or its contents. The aforementioned prohibited actions also apply to employees, students, agents and/or any staff under Facebook's direction or control. The content of this profile is private and confidential information. The violation of my privacy is punished by law (UCC 1 1-308-308 1-103 and the Rome Statute). Facebook is now an open capital entity. All members are recommended to publish a notice like this, or if you prefer, you may copy and paste this version. If you do not publish a statement at least once, you will be tacitly allowing the use of elements such as your photos as well as the information contained in your profile status updates..."
Why do you waist your time with this stuff? This statement does not confer any copyright protection for you. You remember the terms you agreed to when signing up for Facebook? Well, by agreeing to those terms and conditions, you gave away any hope of claiming ownership or copyright protection under the laws of the United States or pretty much any country. Just be mindful of what you post and figure that you are giving said material to Facebook. Good luck! Full Throttle Media would like to extend to all our partners, contractors, friends, clients and families a very happy and safe Thanksgiving Holiday. Remember to take a moment and reflect on what it is that you are truly thankful for in these difficult times. If you are able, please try and reach out to someone in need and make a generous offering to help. Sometimes, it is the smallest offering that can make a persons day or year. Do a little more! What does it take to be creative? It does not matter how much you study or how many books or articles you read. You do not become creative by watching others. You can, without a doubt, "copy" or draw inspiration from someone else. But, in order to be truly creative, you have to be able to distill your brilliant idea down to the point where you can bring life to it. That is the hard part. Genuine creativity is an innate ability, I believe. Some have it and some do not. Even some of the folks in the creative industry are not all that imaginative. You know what I mean. How many ads, commercials or shows have you seen that just left you wondering how they ever got approval and more importantly funding? Take the time to get it right. Good creative, I mean GOOD creative is out there. It may just require a little more effort to find and execute. Being able to go from idea to execution is key. And, that is where most genius ideas fall short. The execution is, in many respects, the harder part to pull off. There are lots of creative folks out there. But, there are not nearly as many executors. Beyond that, a lot of the people that could execute given the opportunity are never given that opportunity. I know so many organizations that stubbornly stick with the same old same old for way too long. 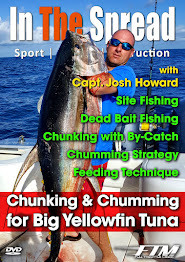 The sport fishing industry is a prime example. Please, stop the madness. We are tired of seeing the same thing repackaged year after year. Creative friction is good. Embrace it! Use a new team. Hold yourself and others to a higher standard. With good friction comes an even better flow of creativity. Properly distill your thoughts. Really thinking through your concept will bring forth insights into what the end user or client wants and needs. Now you will have even better ideas about how to execute on your creative inspiration. The distillation process takes time. Sure, sometimes it can happen in a flash, but more times that not it takes a fair amount of time. Invest that time and everyone will be happier for it. The most important point is to find and work with really creative people that can deliver.